Dentistry has the ability to whiten most teeth. This can be accomplished in one of two different ways. 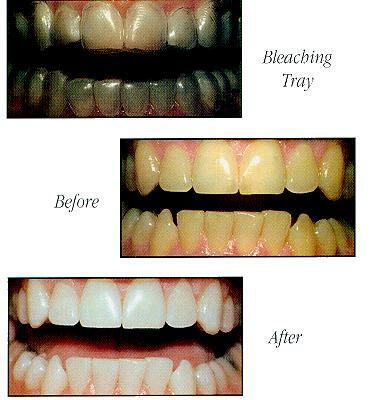 In office "Power Bleaching" is usually a one visit office procedure for most people. The teeth are isolated. 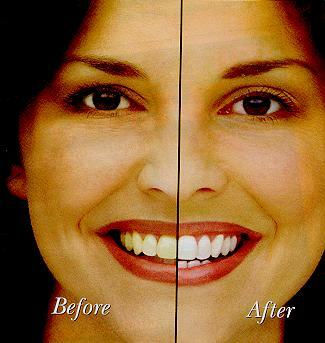 A powerful bleaching agent is placed on the teeth. With the use of a computerized light, Oxygen which bleaches the teeth is released. This immediately lightnens most teeth. At Home Bleaching is a completely different procedure. Many consider it a vast improvement over former whitening techniques. It is effective and can be done while you sleep. A chemical gel preparation containing carbamide peroxide is placed on the teeth in a special tray. During a diagnostic visit impressions of the upper and lower teeth are taken. This allows for the construction of custom gel holding appliances called bleaching trays. On the second visit, the trays will be fitted and you will be given a special bleaching gel and specific instructions on how to administer it and how often to wear your trays. Follow the directions carefully and continue to maintain proper oral hygiene through brushing and flossing. Maximum aesthetic results will be obtained in most cases two weeks after following the specified procedure.